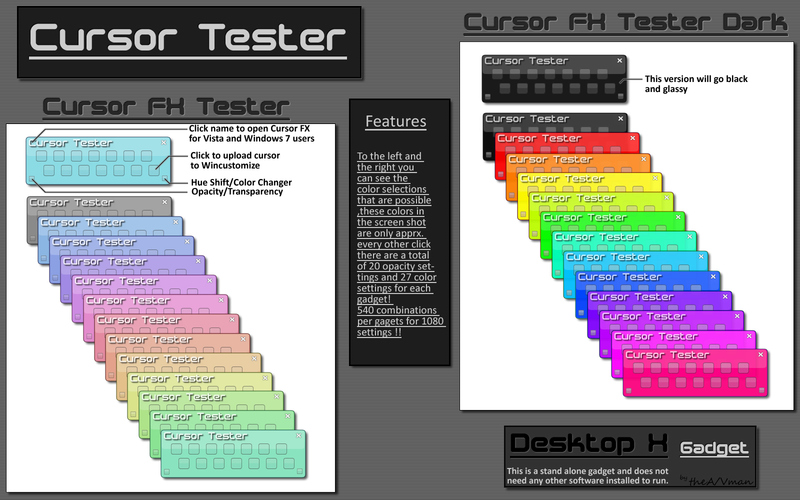 This is a gadget to test cursors with.I built one as a DX Object about 2 yrs ago Link but this one has been designed more in the direction of cursor users and builders . It has plenty of diffent visual adjustments so yo can make it look good on any desktop. There are alot of states to the cursors some are rarely seen this gives you a way to see them all!No programs are needed just download unzip the file and double click the version you want.Thanks to sViz and RND for scripting and Jaramia for skin inspiration. Great job. I still use the first one. Thank you AVMAN. muy bueno excelente!!!!!!!!!!!!!!!!!!!!!!!!!!!!!!!!!!!!!!!!!!!!!!! !gracias !!!!!!!!!!!!!!!!!!!!!! !saludos de argentina!!!!!!!!!!! !